has TBBT ever had that huge rating? The 8:30 PM episode of The Big Bang Theory went up to 20.44 million viewers, an all-time high for the series. Its demo numbers also were adjusted up, to a 6.1 in 18-49 (for the 8:30-9 PM half hour). 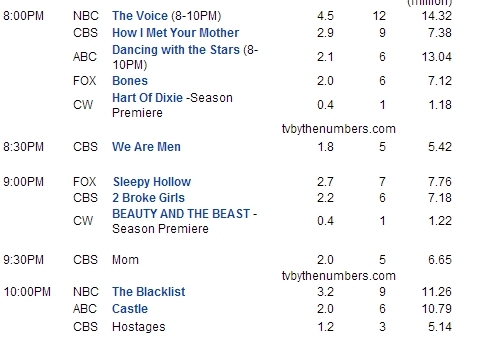 The Blacklist still very strong, FOX shows did really well, Castle as usual, CBS is really struggling which is a big surprise. Hostages is (almost) officially dead and We Are Men is DOA... which is a shame, because the pilot episode was mildly entertaining. seems that CBS has failed this fall. being always so strong, suddenly picked shows that nobody likes. Yeah, Hostages was too "high concept" and they weren't able to pull it off. Good cast, but it quickly degenerated into a series of contrived crises. Not the first show killed by cliche overdose. Agents of Shield dropping from 4.7 to 3.1 (!!) - yeah, that's not going to be a long run. 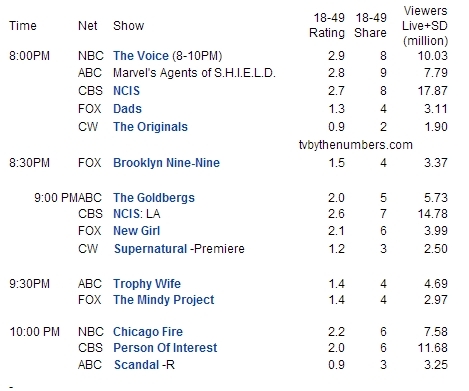 CBS doing good except for PoI which doesn't seem to be handling the new day & time slot very well. FOX may as well start planning a whole new line-up, because only New Girl is doing decent. Fun thing, Revolution is supposedly a lot better in its second season. Ironside is a no brainer on why the ratings are low. Underwood is great as always, but the premise, man. 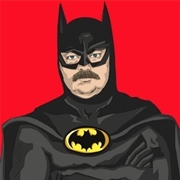 i accidentally downloaded s02e01. and deleted it after 1 minutes of watching. too painful. 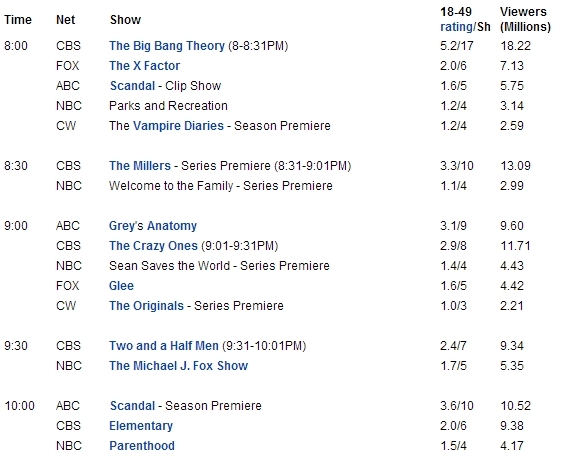 It's a shame that Parenthood is losing viewers in its new timeslot. 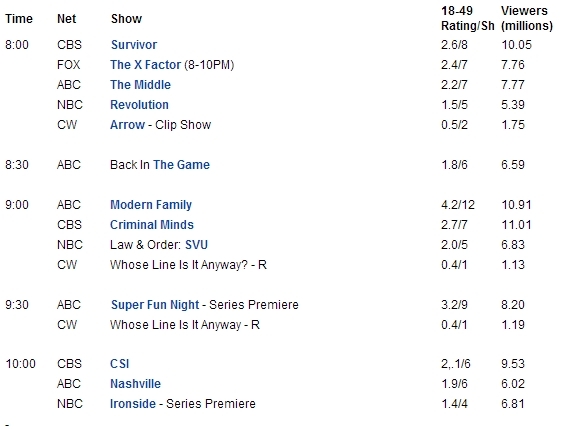 CW shows premiered meh... imo TVD spinoff is at least a year too late, because the main show is losing key viewers. Most of long running series have lost a lot of viewers in the recent years and reality shows aren't an exception. Survivor seems to be doing pretty ok, certainly much better than Big Brother. NBC - Folks, we've got beautiful weather. FOX - We know it's not a yacht, but it'll do. ABC - Something's wrong with our engines. CBS - Is that an iceberg ahead? 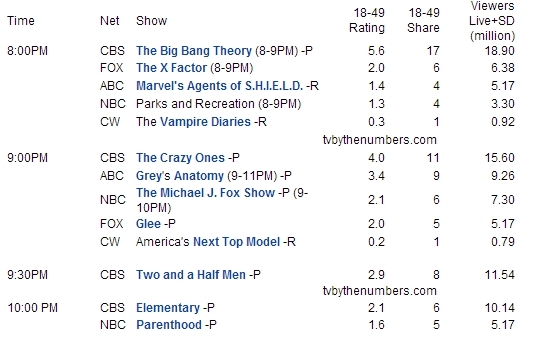 I wonder how many years of bad ratings CW has left... I just hope they'll at least finish Supernatural before they close down. 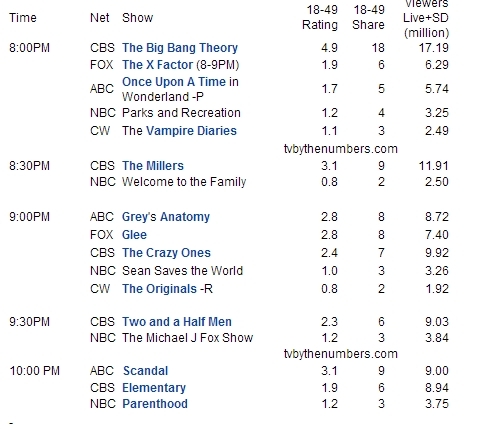 And CBS is really screwed... only HIMYM is holding up pretty good on Mondays. 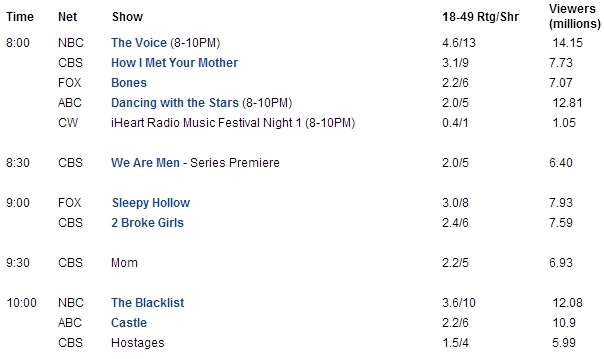 And it's funny how Bones & Castle seems unaffected by other shows... talk about having a loyal fanbase. Wow @ SPN season 9 premiere. The episode itself deserved it... it was pretty damn good. 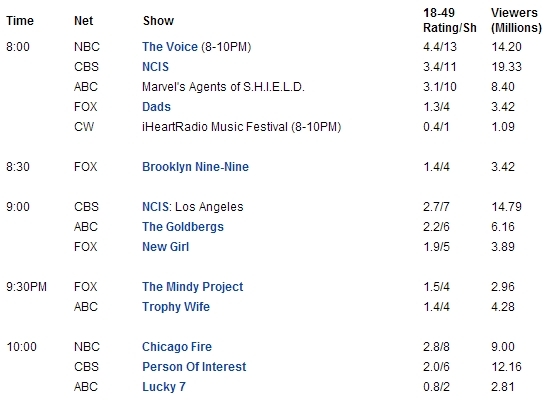 Also, it's nice to see that Brooklyn Nine-Nine was second best at FOX behind New Girl. 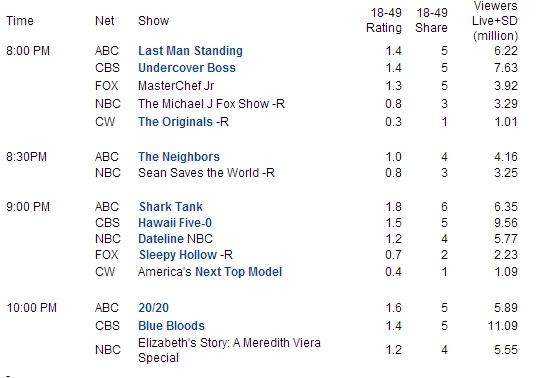 That's just great... they paired Parenthood with NBC's crappy comedy block (crappy in the ratings, not quality department) and now it's also sinking. Also, Once Upon spinoff flopped.